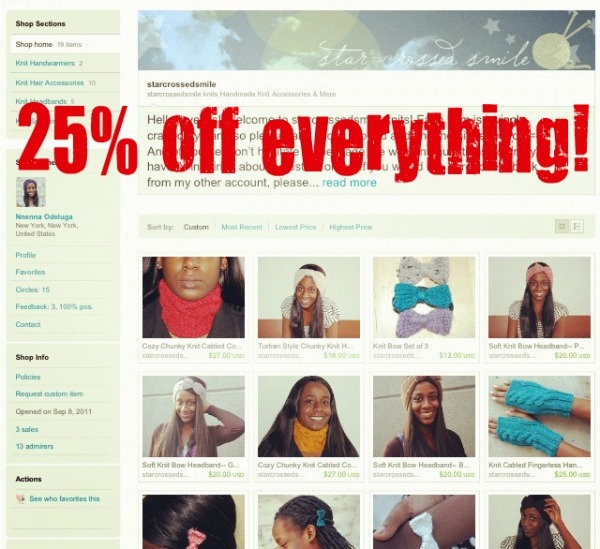 Black Friday/Cyber Monday Discount for star-crossed smile knits! I’ll keep this brief because I know you guys have lots of shopping to do today and so do I! Everything in my etsy shop is 25% with the discount code SCSHOLIDAY! This discount code will be active from 12:01 AM on Friday November 25th until 11:59PM on Monday November 28th. Also, I am offering free gift wrapping for the holidays (and I can send it directly to the giftee if you’d like)! If you want your purchase to be gift-wrapped, just include that in your message after you’ve purchased your item. I’m also still taking custom orders, so please don’t hesitate to email me if you have something in mind or if you have questions about anything. Happy shopping to all and I can’t wait to see your Black Friday/Cyber Monday purchases!